In small bowl, mix all dipping sauce ingredients until smooth. Cover; refrigerate until serving time. In saucepan, heat 1 inch water to boiling, or place steamer basket in 1/2 inch water in saucepan (water should not touch bottom of basket) and heat to boiling. Add bean sprouts. Cover; cook or steam 2 minutes. Immediately rinse with cold water; drain. Repeat with cabbage and pea pods. Place rice-paper wrappers, 2 at a time, in bowl of hot water 45 seconds. Remove and place on plate. When completely soft, separate wrappers. Place about 2 tablespoons fish, 1 tablespoon each bean sprouts, cabbage and pea pods, 1 teaspoon cilantro and 1/2 teaspoon peanuts on center of each wrapper. Fold one end of wrapper up about 1 inch over filling; fold right and left sides over folded end. Fold remaining end down, wrapping around roll. Serve with dipping sauce. Rice paper, an edible sheet, is made from a dough of rice flour, water and salt. It's great to have on hand for wrapping a variety of fillings. Carefully wrapped in a plastic bag to keep out moisture, rice paper can be stored up to one year. 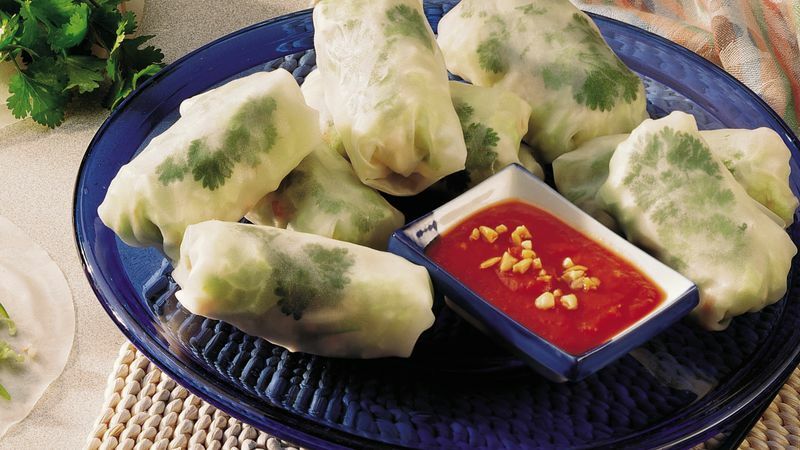 Toss any rice paper that has curled and cracked edges.